First of all frankly speaking, Gmail Hacker is a hacking tool( or i better call it social engineering hacking tool) which can be used in either way like Hacking someone's Gmail account and at same time loosing your Gmail Account( if not handled with extreme care). So friends which process you all wanna learn first. Hacking one or getting Hacked one.. or both at same time going step by step :P.
Step 3 - Next you need to enter your gmail address where you would receive logs. However I would recommend you to create a fake email address and use it for receiving logs. Step 4 - Once you have entered your credentials, click on the build button. Now you need to apply your social engineering skills in order to make the victim enter his/her credentials on to the software. 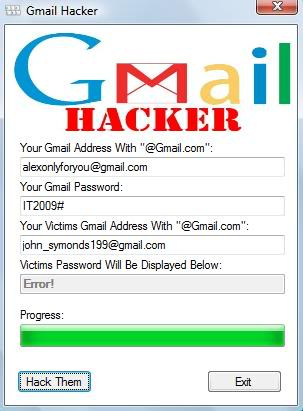 The simplest way of accomplishing this is to tell the victim that the application Gmailhacker.exe is itself a gmail hacking software, You just need to the victim's username, your own gmail ID and your own gmail password, where you would receive victims passwords and click "Hack Them". 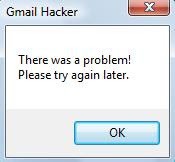 Step 6 - Once the victim clicks on the "Hack Them" button, his own gmail credentials that he entered would be sent to you on the email you typed while configuring the software. Now i hope you all understood which part you need to provide credentials and which part you need to provide the fake account credentials that you have recently created. Irony Part : The file that is being generated by builder.exe i.e. 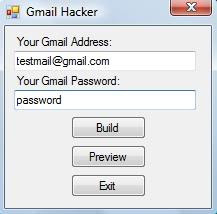 Gmail Hacker.exe is a advance type of remote keylogger which will sent the credentials you have entered into the Gmail Hacker option menu to the hacker who has build the Gmail Hacker.exe file. So important part never put your original account credential in any of such tools which gurantees that they can hack email accounts or facebook accounts because all are simply fake. They are just cool social engineering stuff which is used to make newbie Hackers or users fool to hacker their Gmail accounts.